and most of all, the reason you should take this training is because you are a member of the Pakistani society. Please register yourself ASAP as we only have a few slots available. Identifying Basic constitutional rights of women. 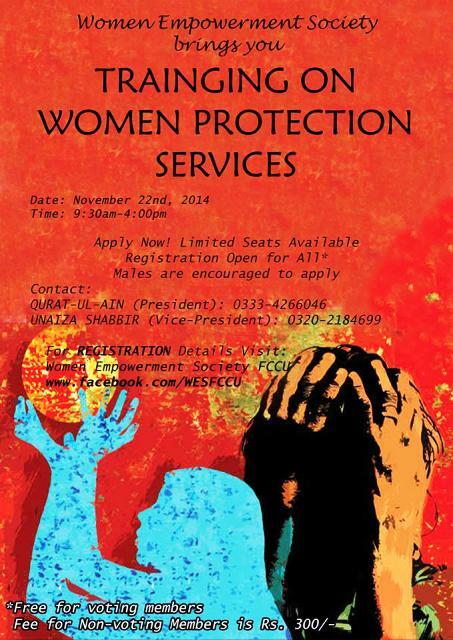 Salient features of the existing women protection laws of marriage, divorce and custody laws of Pakistan. Join our fight to bring gender-based equality to Pakistan and help women and to give them the rights and respect they deserve. We only have 35 seats available so apply as quickly as possible. This event is entirely free to voting-members of WES FCC, however there is a nominal fee of Rs 300 for non-members of this society. 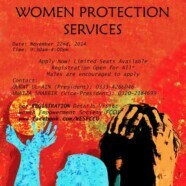 I am seriously interested to participate in Training workshop on providing Women Protection Services. Please, guide me further fro Registration as I am not a student of FCCU at the moment.